Various colours of Double Knit yarn, approximately 150g in total. Tunisian Entrelac crochet is very simple when you get the hang of it and understand the basic principles of how it is made. It is worked in rows of Entrelac Squares in a diamond formation, right to left. Always work with the Right side facing you, do not turn your work. These Entrelac squares are each made of 5 rows of Tunisian Simple Stitch (which consists of a Forward Pass and a Return pass) and 1 row of Slip Stitches across the top of the square. It is important to make sure that the overall tension is not too tight; the fabric this type of crochet makes is very dense and it needs to ‘breath’. This is very important for the row of slip stitches as we will be crocheting out of them in the next rows so they need to be loose! This basic Entrelac pattern can be adapted to make cushions, throws and blankets. To begin, make a foundation chain of 100. When working the first row of each square out of the foundation chain, work through the top loops of the chain only to help prevent curling. chain (2 loops on hook). *Insert hook in next chain, yarn over and bring back through the chain* - repeat this 5 times until you have 7 loops on your hook. Return pass – *yarn over and through 2 loops on hook* - repeat this 6 times until you have 1 loop left on your hook. 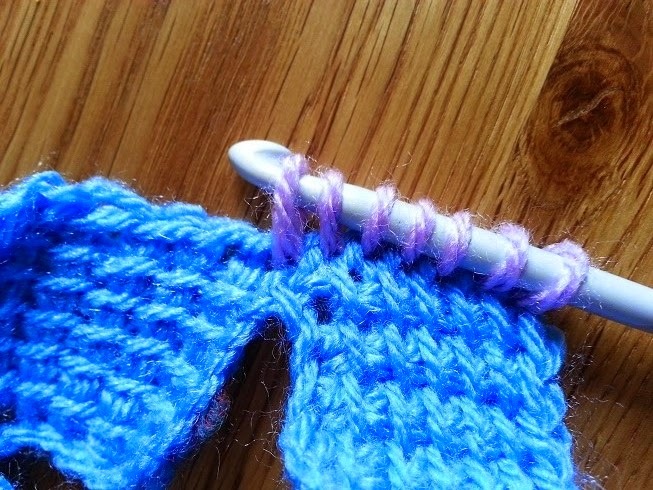 Forward Pass rows 2-5 – Insert hook in second vertical post (where the needle is showing in the picture), yarn over and back through the vertical post. Insert hook in next vertical post, yarn over and back through the vertical post. Repeat this 5 times in each vertical post along the row (6 loops on hook). 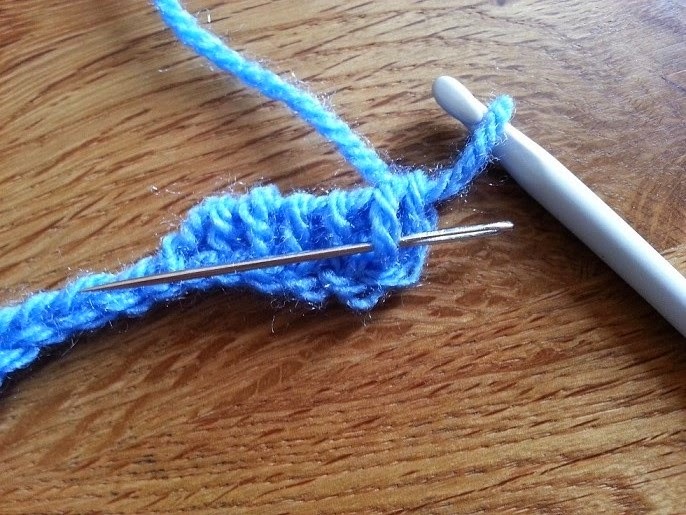 Row 6 – Loosely slip stitch across the top of the row by putting your hook under the next vertical post, yarn over and through 2 loops. Repeat this 5 times. Slip stitch in next chain of your foundation chain row (6 Slip stitches made). This last loop on your hook is the starting point of the next square. Second to Ninth Square - Repeat as above. To help you remember, Forward Passes have 7 loops on your hook, Return Passes *yarn over and through 2 loops* 6 times. At the end of the ninth square you should have one chain left, slip stitch into this chain and fasten off leaving a long tail length for sewing in later. 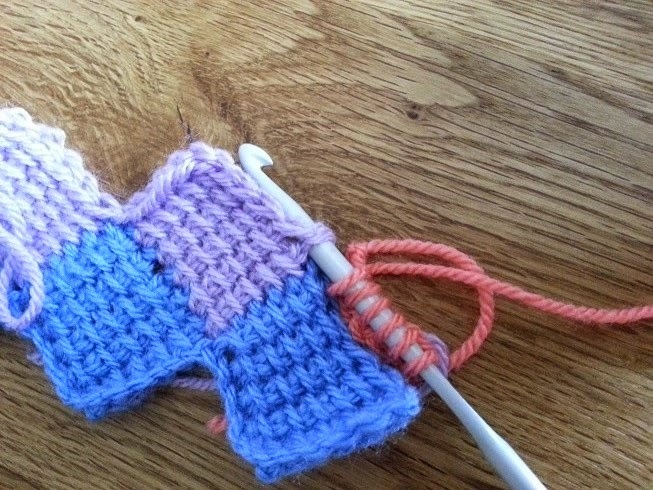 First Forward Pass – Join a new colour by drawing up a loop in the first slip stitch of the top right corner of the first square of the previous row. Do not chain or knot the yarn to hold it in place as this will give a lumpy finish. Just start working with the yarn leaving a long enough tail to secure it later. 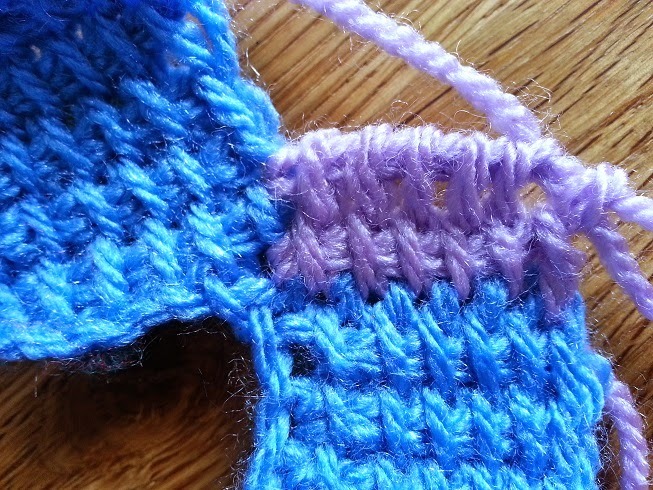 Insert hook in next slip stitch, yarn over and back through – repeat this 5 times (6 loops on hook). 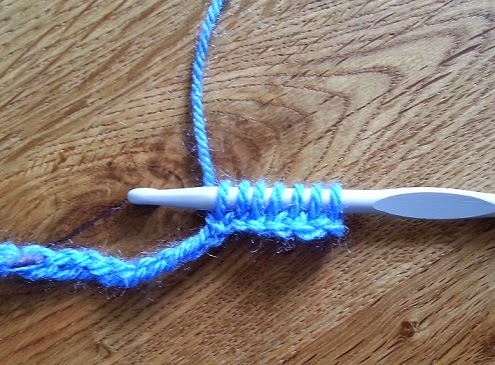 Return Pass – *yarn over and through 2 loops* - repeat this 6 times until you have 1 loop left on your hook. 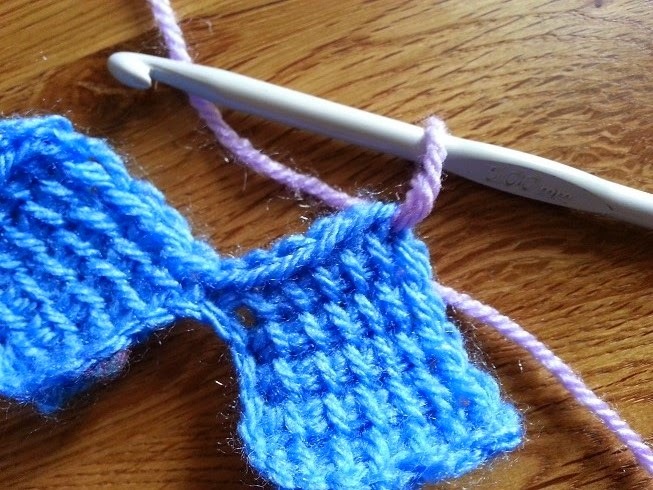 When 5 rows have been made, slip stitch across the top of the row (as with the first row of squares) making your sixth and final slip stitch into the top right corner of the next square of the previous row. Carry on working squares across the row in the same way until 8 squares are made. Fasten off. As this row has more squares in we need to make a small foundation chain to work the first square out of. Carry on making the squares as with the previous squares so each square has 5 rows of Tunisian Simple Stitch and one row of slip stitches across the top. Make 7 more squares in the same way as with the previous row of squares. For the last (ninth) square of this row - Draw up the loops through the slip stitches as with the previous squares of the row (6 loops on hook), make the 7th loop by inserting your hook in the corner slip stitch of the first row of Entrelac squares. Return Pass - Yarn over and through 1 loop on hook *Yarn over and through 2 loops* 6 times until you have 1 loop left on your hook. Repeat Second and Third Entrelac square rows until you have 16 rows in total. The Other side of the bag is made in the same way however the number of squares in each row is different; start with a foundation chain of 89 and make 8 squares in the first row. The second row is 9 squares, then 8, then 9 and so on until you have made 16 rows. I followed the same colour sequence for the front and back of the bag so that when it is sewn up both sides match. Using the tail ends of each row, sew the front and back of the bag together. Do this by placing right sides of the bag together and sewing along the edge. Make sure the colours match up so it appears as if each colour goes all around the bag with no join. To finish off the top of the bag Crochet a neat row of normal double crochet all around. 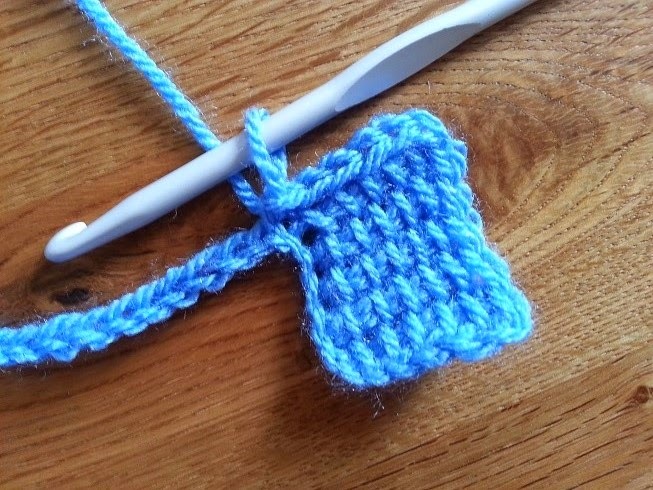 At the point of each square do 2 Double crochets and in the dips do a double crochet decrease, (or DC 2 together). The straps of my bag were made by making several rows of Tunisian Simple Stitch on a Tunisian crochet hook (approximately 100 stitches each row). An alternative way of making the straps is to chain 10, DC in each chain across, *chain 1 turn, DC in each stitch across* - repeat until you reach the length of strap that you want, changing colour where you wish. Sew up the long edges of the strap to make a tube and then sew the ends of the strap onto the body of the bag. Make two. There you have it, one bag made! 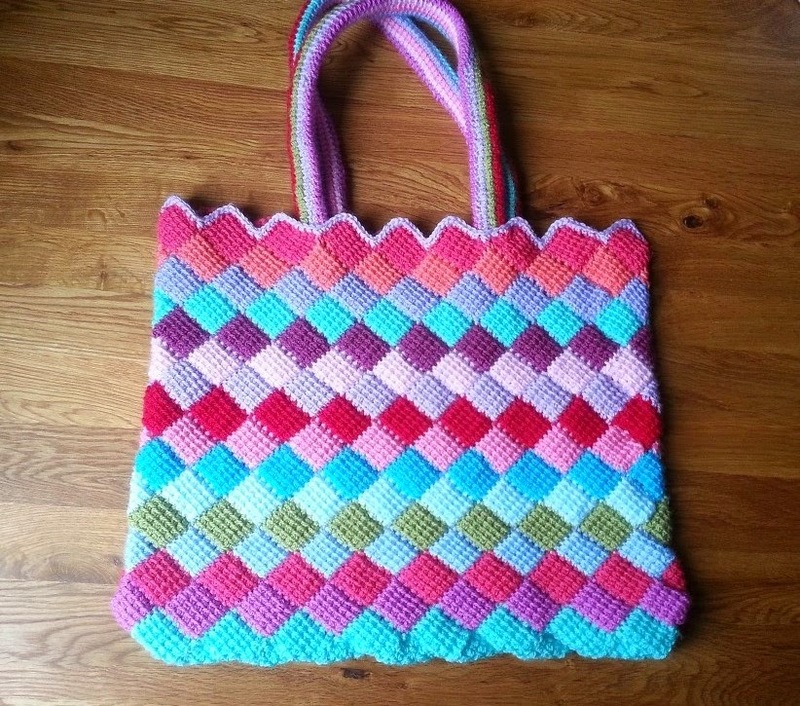 Please do share any pictures of your finished bags by twitter @hookingcrazy or on facebook.com/hookingcrazy I would love to see them! 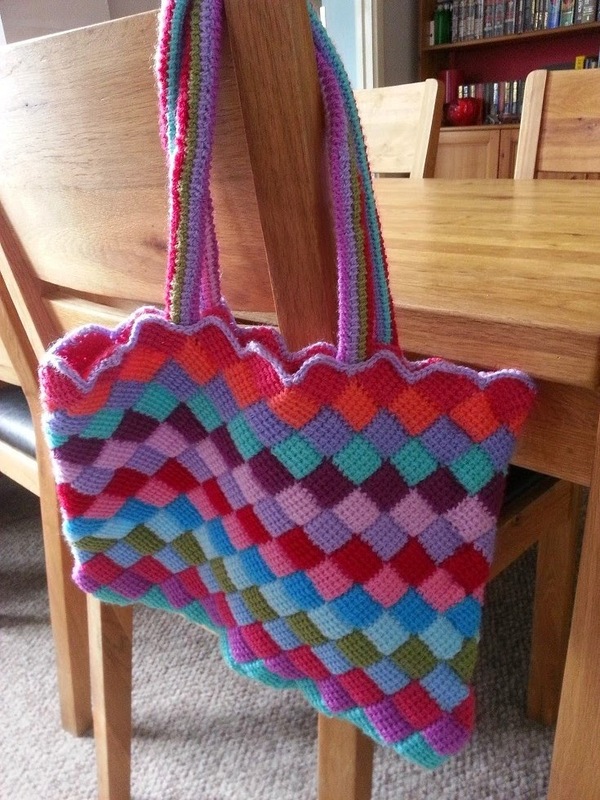 Hi Claire, thanks for having a go at this bag and for your feedback. i will add a couple of lines into the pattern to clarify what you do with the last square on the rows where you aren't working into the square from the previous row. I'm glad you managed to get there with the help of youtube. I can't wait to try this! Your pictures are so clear and easy to understand! Best I've seen yet! Thanks! Thanks for your pattern. It's just what I was looking for to make my sister as a gift. Can't wait to try it! Hiya I am new to this stitch. I loved making this bag. Got the 2 sides done how do I sew them together, it has me confused what way they should be sewing.